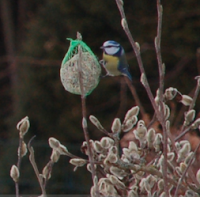 This past week I put up some balls of fat mixed with seeds for the birds in the garden. Because of the heavy frost and heaps of snow the little critters go quite hungry because regular food sources are non-existent or scarce. Mouser is quite pleased to see so much activity not too far from the house.